Now! An iPad! That's another matter altogether. How else would I play Angry Birds? Or check my e-mail when I'm lying in bed? An iPad is not a necessity to life but it is a happy little convenience. I'm not sure why you'd need a Kindle when there are perfectly good books to be held, touched and smelled. I know I can't convince anyone of this fact so I don't really try. I just stubbornly refuse to own one myself. I will never read a book on a screen so long as I live and that's a promise I feel safe to make! Peter Pauper Press just released a new line cute and adorable covers to fit iPads, Kindles, Kindle Fires or Nooks. (I am happy to say that I don't even know what a Nook is but I can guess well enough.) Heh. They were kind enough to send me a sample of their Owl NeoSkin Cover which I really love. It's cute. It's soft and offers protection for my Angry Bird game consol. (snicker) I like having a protective covering for a variety of reasons including: small children who frequently carry it around and also to keep it safe when we're traveling. You can see Peter Pauper Press's line of Kindle covers, Kindle Fire covers, iPad covers, or Nook covers by clicking on the links. I am happy to let you know that this beyond generous company has offered to give away one case to one of my readers here at Reading to Know. B.) If you would prefer the Owl design or the Cupcake design, both of which I've pictured above. 2. Leave a valid e-mail address for me to contact you should you be selected as the winner. That's it! This contest is open to U.S. residents only and will be open until Monday, February 20th. THIS CONTEST IS NOW CLOSED. THE WINNER, as selected by Random.org, IS SHONYA (who chose the owl cover.) Congrats! Thank you, Peter Pauper Press, for sending a sample of this new product my way and also for offering up one to one of my readers! What's the likelihood that I'll win since I'm the first commenter? And because I need a cover for my Kindle?!?!? ;-). Love the owls! I feel terrible saying this now... but I'd really like the Kindle Fire cover. :) The cute cupcake one. I must admit that I am curious about your dislike of e-readers. Feel like sharing? I'd love the cupcake design for the kindle! I really like the owl one. Well, you know which cover I'd need. ;) (kindle fire) M loves using the Zoodles app on it and I love the control it gives me for what he can and can't do. I think the owl cover is adorable. I like the cupcake one and I'd get it for my iPad. 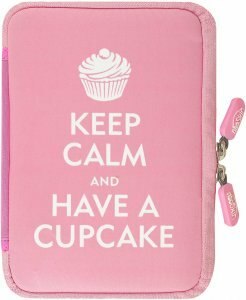 I would love the cupcake Kindle cover! It is so cute! I would like the cupcake cover for a kindle fire. I would like the ipad cover in the cupcake design, thanks for the chance! I would pick the kindle cover. I think the cupcake one is so cute! 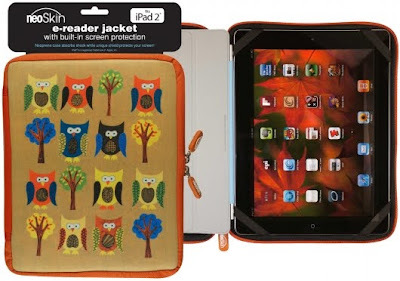 Haha- the owl one for Nook Tablet (which is not an ipad but sort of similar in addition to being an e-reader). I would choose the cupcake cover for the Kindle. I don't have one yet, but I plan to get a Kindle touch soon. I never thought I'd get an e-book reader, but I plan to use it for obscure books that I can't find or can't afford to get hard copies of.